As the New Business Coordinator, Robin Claussen is responsible for all of the insurance applications and investment transactions that clients initiate with the firm. She works closely with advisors and clients to carefully see insurance applications through the underwriting process, and investment applications through to delivery. Robin worked alongside Paul Gullickson for many years at MassMutual. When Robin’s agency position changed in 2013, she accepted the partners’ invitation to join the Gullickson Group. Given her long association with Paul and his sons, Robin easily stepped into her new role.She particularly enjoys the family-friendly atmosphere at the firm. Steeped in detail, Robin’s job requires attention to detail, systems focus, and organizational ability. Robin is very mindful of the confidential nature of her work and feels privileged to be able to assist clients with the things that truly matter most in their lives. Robin earned her Certificate in Accounting from Kaplan University. She is licensed to offer life, annuities and health insurance in Iowa. She pursues ongoing education in her field to stay abreast of trends and regulations. 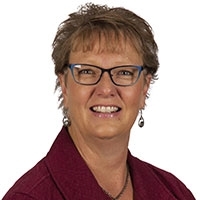 In the past, she has completed courses on topics including insurance administration, business law, and insurance company operations through LOMA, an international trade association for the insurance and financial services industry. When she’s not at work, Robin likes to spend as much time as possible camping with her husband, John, their children, and grandchildren.